The wonder of the underwater world is the great attraction of scuba diving. But probably a top bucket list experience for most divers is diving with the huge gentle Manta Rays. And what an experience it is! Mantas can grow as long as 23 feet and weigh as much as several thousand pounds. They have developed wing like pectoral fins which give them an incredibly graceful and elegant swimming style. The color pattern of each manta is unique so each individual can be identified and tracked. In spite of their great size Mantas feed on drifting larvae, shrimp, small crustaceans and fish eggs. They funnel this soupy mix into their mouths with protuberances on the side of their head. These strange looking lobes gave rise to the name “devilfish” because these looked like horns to early sailors. Manta is the Spanish word for blanket so that one of largest gentlest creatures in the ocean was referred to as a satanic blanket! 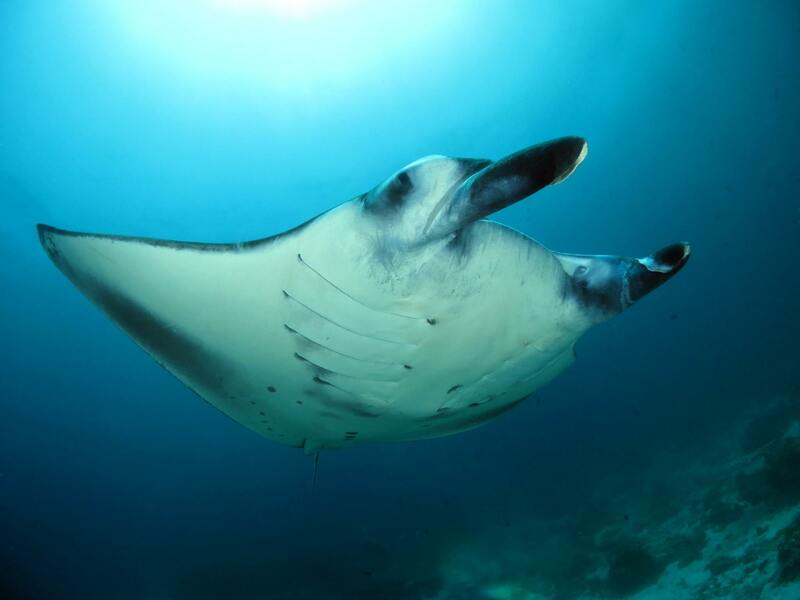 Mantas have tough cartilage instead of bones belonging to the same biologic order as shark, sting rays, and eagle rays. Most rays have their mouths on the underside of their head and they mostly forage for food in the sand. Mantas are true filter feeders and have their mouths right up front. Mantas are apparently private about their private lives so their reproduction cycle remains a mystery to biologists. Triggering mechanisms for mating are largely unknown. The fertilized eggs actually hatch within the mother manta and the pups are able to obtain nutrition and oxygen without any umbilical cord! Gestation period is about 10 to 12 months yielding one or sometimes 2 pups. Time between births is still unclear. The pups resemble miniature adults and are on their own after birth. Mantas are foundin all the tropical waters and sometimes in more temperate areas. They swim in large groups up to 50 individuals as well as alone. 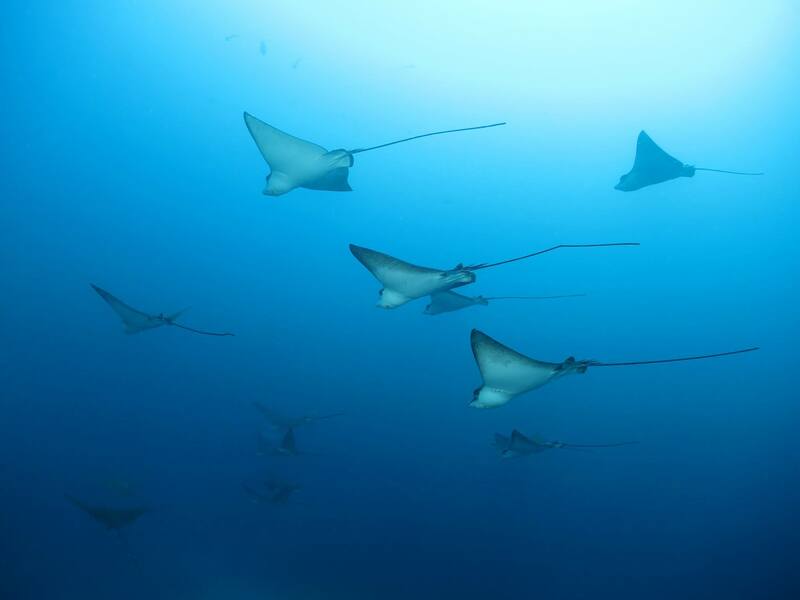 As of 2011 Mantas are strictly protected in international waters. However they are still categorized as “Vulnerable” because of unregulated fishing in some areas and their slow rate of reproduction. Mantas seem to be very tolerant of the wriggling bubble emitting four limbed graceless creatures that sometime share their feeding and cleaning undersea areas. They appear to notice us but somehow are not bothered by our presence. If you would like the unique experience of swimming with Mantas, JUST ADD WATER SCUBA with full service stores in Willoughby and Fairview Park, Ohio offers multiple worldwide group scuba trips including annual trips to the Maldives and to Socorro, Mexico where you can spend time underwater with Manta Rays at cleaning and feeding areas.